How Should I Treat My Disease? 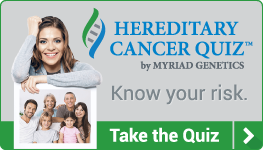 | Myriad Genetics, Inc.
Personalized medicine — also known as targeted medicine or precision medicine — is a rapidly-evolving area of healthcare in which the treatment for a medical condition such as cancer is tailored to the individual patient and his or her biology. There should not be a one-size-fits-all approach to medicine. The goal of personalized medicine is to prescribe the right medicine for the right patient at the right time. Companion diagnostics are medical tests that make personalized medicine possible. Designed to be paired with a specific drug , companion diagnostics help healthcare professionals determine which patients could be helped by that drug and which patients would not benefit, or could even be harmed. Unlike other laboratory developed tests, companion diagnostics are reviewed and approved by the U.S. Food and Drug Administration (FDA), which is the gold standard for ensuring safety, effectiveness and quality. FDA approval gives physicians confidence they are receiving the highest quality test result on a consistent basis. Personalized medicine is the future of healthcare, not just for cancer, but for disease in general. Companion diagnostics will be critical tools that all physicians will need in their toolbox as healthcare moves forward. In addition to cancer, companion diagnostics hold promise in the treatment of other chronic diseases such as rheumatoid arthritis, other autoimmune disorders and diabetes. 1. Intended Use: BRACAnalysis CDx® is an in vitro diagnostic device intended for the qualitative detection and classification of variants in the protein coding regions and intron/exon boundaries of the BRCA1 and BRCA2 genes using genomic DNA obtained from whole blood specimens collected in EDTA. Single nucleotide variants and small insertions and deletions (indels) are identified by polymerase chain reaction (PCR) and Sanger sequencing. Large deletions and duplications in BRCA1 and BRCA2 are detected using multiplex PCR. ***U.S. Food and Drug Administration. Personalized medicine and companion diagnostics go hand-in-hand. Available at http://www.fda.gov/ForConsumers/ConsumerUpdates/ucm407328.htm. Katya talks about her journey with ovarian cancer and how knowing her BRCA status has helped guide her cancer therapy.